Prepping for an earthquake is pretty straightforward and simple. An earthquake is literally the earth shaking from seismic activity, usually caused by the constantly moving tectonic plates beneath the earth’s crust. They can also be caused by volcanoes, landslides, or even nuclear detonations. Earthquakes themselves can, in turn, cause volcanic eruptions, landslides, and tsunamis. 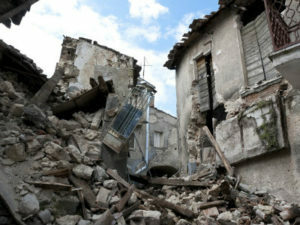 There are areas of the world where fault activity is more active which can make those areas more prone to earthquakes. Many of these faults fall within the “ring of fire” which is a ring of fault lines that surrounds the Pacific Ocean. About 500,000 earthquakes happen every year but the majority of those are minor and are usually not felt. The moment magnitude scale is used to measure earthquake magnitude, and is a pretty good approximation of an earthquake’s destructive potential. While there are several other factors that affect how much destruction an earthquake could deal, it is easy to compare the energy released as it is measured by the moment scale. It replaced the Richter scale in the 70s and is used to describe every large earthquake by the USGS since 2002. These scales are logarithmic (like the TrueRisk index) which means the larger numbers on the scale equal a much larger reading of energy released. An earthquake that registers a 7.0 has released 1000 times more energy than a 5.0 earthquake. As you have probably seen or heard, earthquakes can be pretty severe. The looming threat of a megathrust earthquake hangs over regions near tectonic plate boundaries. These plate driven earthquakes can exceed a moment magnitude of 9.0. These earthquakes are almost guaranteed to cause a domino effect, or chain reaction. The last earthquake over 9.0 was a megathrust earthquake off the coast of Tohoku, Japan. This earthquake caused a tsunami, flooding, fires, and the Fukushima Daiichi nuclear power plant accident with an estimated economic impact of $235 billion. Yes. An earthquake, series of earthquakes, or megathrust earthquake could definitely become a disaster component leading to TEOTWAWKI. Shifting plates on our planet has more than enough potential to cause unforeseen devastation on our population. 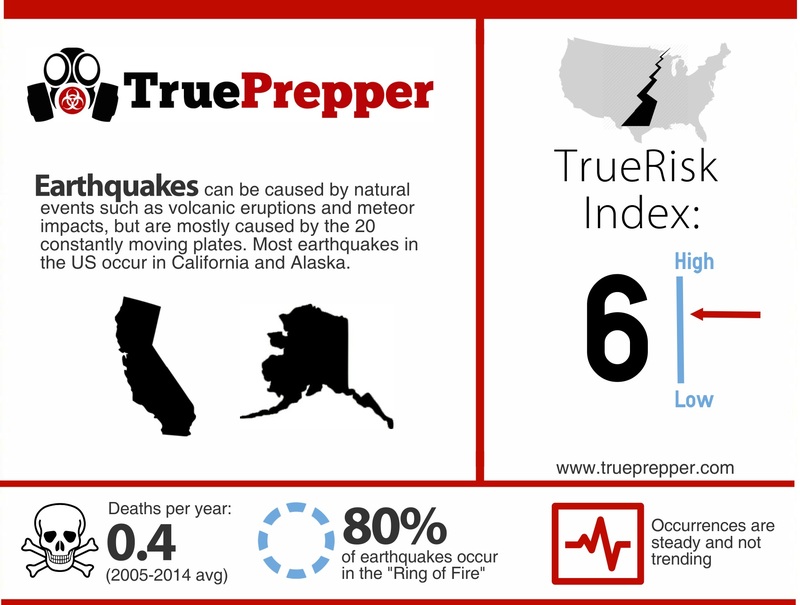 Earthquakes ring up as a 6 on our TrueRisk index. This risk is very geographically dependent, since it is higher for those that live near fault lines or areas with frequent seismic activity. While many structures in these areas are built with earthquake codes and higher standards in mind, the increased exposure and potential for megathrust quakes still show vulnerabilities. Depending on the magnitude, the kits and plans that you will need can change. While a megathrust earthquake will require a full survival kit and possibly a bug out bag and plan, more common earthquakes simply need an earthquake kit and plan. While most of the kits listed below are for the worst case scenario, they can help during more common, lower magnitude earthquakes as well. The earthquake kit is a specialized kit that everyone should own who lives near a fault line. Planning is very important for earthquakes, and should be done well in advance. Earthquake proofing your home should be a part of your typical emergency plan, as well as what you plan to do in the event of an actual earthquake. Whether you receive advanced notice, or are just noticing the tremors, you will want to see shelter immediately. If you do not have a designated shelter in the center of your home or building, hunkering down under doorways and sturdy furniture is the best idea. Steer clear of heavy wall hangings, bookshelves, or anything else that could fall, tip, or collapse. Earthquakes often are accompanies by aftershocks, so don’t assume the earthquake is over after the first tremor. Once the aftershocks have subsided you will want to make sure that everyone is accounted for and not injured. If there are injuries or casualties, administer first aid if you are trained and have authorities contacted if you are able. Be wary of domino effect disasters after an earthquake that could include, but are not limited to: volcano eruptions, tsunamis, house fires, HAZMAT incidents, and landslides. Most of these depend on your location geographically or how your home is constructed, so researching these threats is important before you experience an earthquake. If your building or house structure is damaged in any way, you should make arrangements to stay elsewhere. If you are in an urban area, search and rescue personnel will likely relocate you anyways, so making arrangements sooner than later is best. Take time after the earthquake to reflect on the disaster and shore up any elements of your plan or kit that you found lacking.